Time for some horseback riding fun with Mia down at the Sunshine Ranch. Wake her up in the cozy apartment and make breakfast in the kitchen. Have her eat breakfast and take her downstairs to take care of the horses. This is where the fun really starts. Look after the foal and groom her, then go out riding with her friend Liza. There’s a world of great adventures waiting for these best of friends. Includes Mia and Liza mini-doll figures. Last known price is 12% above the initial Lego retail price! The Sunshine Ranch (41039) Lego set is no longer directly available from the sites below. However, 3rd party partners of these sites might still have the set available. 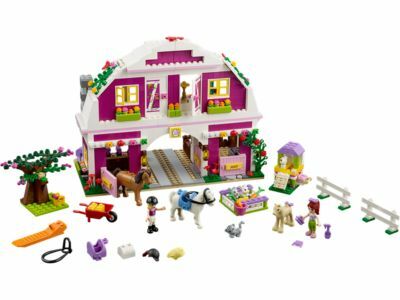 Alternate description Horses love LEGO® Friends Sunshine Ranch so join Mia as she rides and groom them as well as using the stables, jumps and cute accessories!